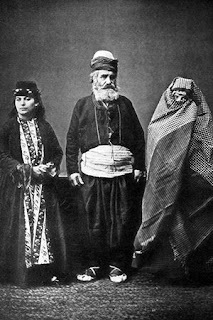 In 1915-1916 Western Armenia was mostly emptied of its native population, massacred and deported during the execution of the genocide planned by the Ottoman government. There was a moment during the war, when Armenians felt that the gigantic sacrifice of human lives had not been in vain. That moment came in February 1916 with the battle for Erzerum. The Ottoman Empire had entered World War I in November 1914 on the side of the Central Powers (Germany and Austria-Hungary, later joined by Bulgaria), which considered it a valuable ally for two reasons: first, it could threaten British interests in the Middle East, and second, it could divert Russian troops from the front in Europe to the Caucasus. The Turkish offensive in the winter of December 1914-January 1915 had ended with the disastrous battle of Sarikamish, where the Armenian volunteer units had also had a share in the victory of the Russian army. It became the pretext for disarming the Armenian soldiers in the Ottoman army and turning them into labor battalions, to be later massacred. 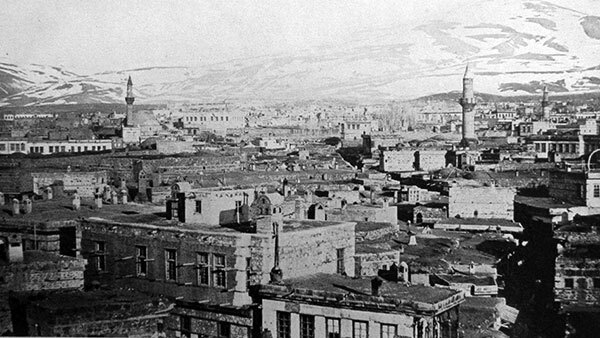 The subsequent invasion of the Russian army in May 1915, when the Armenian Genocide had already started, was able to save the population of the city of Van, but the Russian troops retreated in July. The annihilation of the Armenian population disrupted the supplying of the Ottoman forces. However, the front remained quiet until the end of the year. The end of the Gallipoli campaign and the retreat of the Allied forces from the surroundings of Constantinople would free up considerable Turkish soldiers. General Nikolai Yudenich, one of the most successful and distinguished Russian commanders of the war and commander of the Caucasus army, was aware of this and prepared to launch an offensive. His aim was to take the strategic fortress of Erzerum, followed by Trebizond. It would be a difficult campaign, since Erzerum was protected by a number of forts in the mountains and was considered the second best defended town in the Ottoman Empire. Its fortress was defended by 235 pieces of artillery and the fortifications covered the city on a 180 degree arc in two rings. There were eleven forts and batteries covering the central area. The Russians had 130,000 infantry and 35,000 cavalry. Further, they had 160,000 troops in reserve, 150 supply trucks, and 20 planes of the Siberian Air Squadron. On the other side, Ottoman forces were 126,000 men as of January 1916, only 50,539 being combat soldiers, with inadequate armament and food. They were big on paper, but not on the ground. 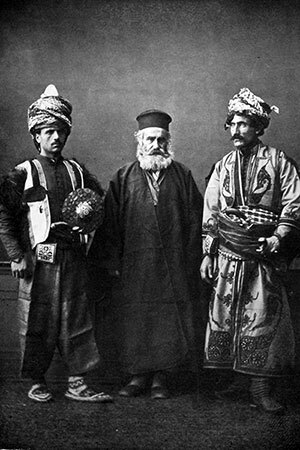 Citizens of Erzerum in their national costumes. It seems that after the disastrous end of the Turkish winter offensive of 1914-1915, the Ottoman High Command did not expect the Russians to make operations during winter. Ottoman High Command did not expect any Russian operations during winter. Mahmut Kamil Pasha, commander of the Third Army, was in Constantinople, and his chief of staff, Colonel Felix Guse, was in Germany. General Yudenich launched a major winter offensive. In the middle of January, there was heavy snow, which often came up to four feet. The Russian plan was to break through a weak part of the line. The initial offensive managed to break through the XI Ottoman Corps, which suffered high losses after a four-day engagement from January 10-14. The Ottoman defensive formation was dissolved within one week, by January 23. Mahmut Kamil returned from Istanbul on January 29. He could feel that the Russians would not only attack Erzerum, but also renew the offensive on the southern flank around Lake Van. Khnus, located further south, was taken on February 7 to prevent reinforcements from Mush from coming in. Turkish reserves were diverted from the northern front, but Russian forces captured Mush, seventy miles from Erzerum. The attack on Erzerum started on February 11 from the south. Once the Russian forces broke through the Turkish lines to the south and began to attack other Turkish positions, the fall of the city seemed inevitable. In three days, the Russians managed to reach the heights overlooking the plain of Erzerum. The Turkish units began to retreat from the fortified zones at the front and also evacuate the city. On February 14 the Russians penetrated through both rings of Erzerum defenses and the remaining forts surrounding the city were evacuated the next day, avoiding encirclement. Russian Cossacks were among the first to enter the city in the early morning of February 16, 1916. The Ottoman army lost a total of 17,000 soldiers during the campaign, including 5,000 prisoners. The Russians had 1,000 casualties, 4,000 wounded soldiers, and another 4,000 affected with frostbite. The Russians gained the upper hand in the battle for control on the Caucasus front with the capture of Erzerum. This one victory, followed by the occupation of Trebizond in April 1916, enabled them to capture or control all the roads leading to Mesopotamia and Tabriz (Iran), and in essence, to control most of Western Armenia. The Russian victory allowed Armenian refugees and survivors from the Caucasus to return to their homes, and for the next year and a half, until the Bolshevik Revolution of November 1917, the liberation of Western Armenian from Ottoman yoke was a reality. In the wake of the Bolshevik Revolution and the subsequent armistice between Russia and the Central Powers, Erzerum was returned to Turkish control. The transfer of power was made official under the terms of the Treaty of Brest-Litovsk in March 1918, when an Ottoman offensive on the Caucasus, against Eastern Armenia, was already on its way.